I have been marketing senior dogs for over 5 years. Here are statistics about the adoptability of senior pets. Of the animals not getting adopted at shelters, 24% are senior pets. Senior pets are not ever going to be the most adopted animals at the shelter. This statistic is true. It will continue to be true. Do I ever use this statistic when I create marketing materials for the senior dogs who are up for adoption? NEVER. In fact, in my world, that statistic ain't true! I promote senior dogs with the belief that everyone wants an older dog. 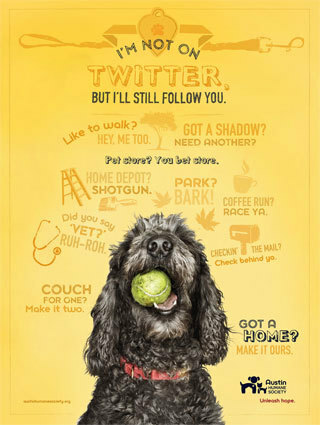 I start out each ad or campaign with this thought: "Ok, pup...how am I going to make YOU a star?" If it sounds like I drank my own kool-aid, you bet I did. Whatever the challenge is that you face in promoting a particular animal in your efforts to get him or her adopted, there is always at least one characteristic about that pet that you can spin into a fun promotion. Your marketing savvy will find a way to make that trait shine! A funny spot on its face? Marilyn Monroe and Cindy Crawford turned their funny spots into signature trademarks. Imagine the attention a pet would attract with either one of those celebrity names AND having a unique facial spot! Not only can you give animals creative names that highlight traits, I've also created a persona around a dog's given name. Check out Soda Pop's story below. I would say this promo was a winner with 11 Shares and the fun interaction it received in the Comments section. "By the end of the last year, the Austin Humane Society reported a 13-percent rise in contributions, not including bequests and other planned gifts, and it has maintained the gains this year, says Amanda Ryan-Smith, director of development. The charity’s most recent year-end appeal based on the ad campaign’s approach generated $100,000, double the amount it raised in 2009. Animal adoptions also increased last year and have continued to grow. From January through April of this year, for example, the humane society has placed 838 pets with new owners, up from 770 during the same months in 2010." Anyone else notice that the poster model of this ad happens to be a black dog? At Muttville, we have a "long-timers" list. If a dog has been on its Available list for over 6 months, s/he is considered a long-timer. This is an internally-shared list only. It doesn't help an animal to announce to the public that s/he has been waiting for a home a really long time. "What I am I going to do with this information as a marketer?" you ask. Well, if I have over 50 animals to choose from to star in my latest marketing ad or promo material, having information such as which dogs have been here over 6 months sure helps narrow down my choices! You should give the spotlight to the ones who need it more immediately than the others. Doing so is going to help those animals a great deal. But I repeat, do not advertise to the public that this animal hasn't found a home in over 6 months. Describing him or her with that information does NOTHING for the animal. Do stores advertise that a product hasn't been selling very well? Of course not. Instead they move the product's display closer to the register or at eye level to ensure it gets increased visibility. It makes sense to do the same for your adoptable animals, doesn't it? By the way, in case you were wondering, in looking back at the previous lists of long-timers for Muttville so far in 2013, black dogs do not dominate the list. I'd like to wrap up my article with a story about one of my first foster dogs. When I was given this dog to foster, my initial impression of him was that he was fat and ugly. He was a blind black & white cocker spaniel. I chose a heroic name for him: Geronimo. I even dressed him up as an American Indian for a costume contest. I had an idea of taking his photo with local celebrities and he even had the chance to accompany us into Tiffany, the very fancy jewelry store! The store manager gave him a gift - a Tiffany ribbon for his collar. He also appeared on the local evening news with a well-known news anchor who loved dogs. When I would talk about him, I never made fun of his less desirable traits. I would answer questions from people about what it was like to care for a blind dog. I would answer, "He taught me that it's no big deal caring for a blind dog. He is very handi-capable!" Geronimo became a local celebrity. His last bit of fame before he was adopted was a nice shout-out in an article about Muttville. The article told of Geronimo's success story in the local newspaper for the city where he was found as a stray. At first glance upon meeting Geronimo, perhaps lots of folks might have had the same initial thoughts that I did. I'll never really know because I never described him that way. And that is the moral of my story.